Wiesel rushes to the defense of Israel once again, proving he is always a political person ahead of being an artistic person. Zionism has always come first for Elie Wiesel. You might even say all his writing has been in the service of Zionism, one way or another. Now a poem made public by one of Germany’s most famous novelists is causing an uproar in the Jewish/Israeli world, of which Wiesel is an integral part. The poet is Günter Grass; the poem’s title is “What Must Be Said.” It is a criticism of Israel’s nuclear capability and it’s willingness to use it against Iran. In an article in the New York Daily News, Wiesel for the second time in the past month, speaks out on a controversy affecting Jews and Israel. While Wiesel is often portrayed as a kind of suffering saint who stays above the fray in his capacity as “teacher” and one who represents “victims of the Jewish holocaust” for the sake of greater humanity, this has never been the case in reality. He is a scrapper and a partisan in every circumstance involving Israel. Everything he does is done to advance the interests of World Jewry. This latest article makes it clear enough. Well, that pretty much covers the Jew’s reasons why we should hate Grass. He was a Nazi! He’s been a secret Nazi, therefore a Jew-hater, all along! He is not an honest man. Therefore, ignore what he has to say … a version of “attack the messenger,” a tried and true tactic which Wiesel is not above using. This particular spat can be seen as another chapter in the historic German-Jewish conflict between two nations that are at eternal odds with each other. The idea that these two “races” will ever overcome their inherent “unlikeness” and be able to live together is a pipe-dream. It never will be, as they are opposites. The problem with Grass’ reasoning is that he believes a reconciliation is possible, and has even been made. As long as he holds this belief he will never get it right. The following are some highlights from what Wiesel wrote, with commentary by me. You can read the entire article by following the link above. Wiesel: […] the German Nobel Prize-winning novelist Guenter Grass has obviously chosen to set himself up as judge over the state and people of Israel. As we know, Elie Wiesel has since even before 1945 set himself up as judge over the nation and people of Germany. But, of course, in Wiesel’s very biased mind he has every right, while Grass has not. Grass, in the eyes of the Jews. is a German perpetrator without any rights at all. Wiesel: [Grass’ poem] makes the argument that Iran is not, in fact, pursuing nuclear weapons — and that Israel is bent on killing Iranians by the millions. […] How dare he? What does he know about the nuclear sciences? What moral credentials could he claim to possess in order to act as accuser of the democratic Jewish state? Is Iran pursuing nuclear weapons? There is no evidence that it is. Further, Iran has been a peaceful nation for hundreds of years. If it did make a decision, several years down the road, to produce a nuclear weapon as a defensive measure, it has every right. Iran is a legitimate nation with an immensely long history, that joins with and follows the rules of international legal organizations, while Israel is a rogue state that ignores and disobeys every international law. So Wiesel’s “how dare he?” is a totally arrogant outburst of someone who’s had way too much privilege in his life … someone who has gotten away with too much. How dare Wiesel question Grass’ moral credentials. In my opinion, they are about on the same level of morality—they are both comfortable with lying—although Grass has bought into the guilt-trip leveled at Germans, while Wiesel rides the high-horse of Jewish-invented victimhood at German hands. Therefore, Grass has no permission to criticize anything Jewish and needs to be put back in his place. Wiesel: Clearly, had the Swedish Academy known of his secret [Waffen SS membership], it would have had some difficulty awarding him the Nobel Prize. Ha! Similarly, if the Nobel Peace Prize committee had known that Wiesel lied about being in the famous Buchenwald liberation photo (not to mention all the lies in his book Night) they would certainly have had difficulty awarding him that prize! Wiesel is skating on thin ice here, but then that is typical of him and his ingrained chutzpah. Wiesel: [Grass’] hatred of Israel, a land founded as the homeland of the Jewish people, is in his poem. In fact, it is the poem. The whole world is coming more and more to hate Israel. In fact, it is impossible for decent people not to hate Israel. If Israel represents what the Jewish people are, what does that tell us? Wiesel should really wake up and stop beating a dead horse. Wiesel: Well, he isn’t the first to claim that the Jewish people’s aim is planetary destruction. Adolf Hitler and Joseph Goebbels preceded him in that kind of propaganda. Bring up the Hitler card, why not? It’s another tried and true tactic. But what is the Jewish people’s aim if not to own the whole world? Their rationale is sometimes given as ” to prevent their own persecution at the hands of the rest of the world.” But it is not a justification, though they think it is. Hitler and Goebbels had more justification for wanting the majority of Jews out of their country in the 1930’s, as do many Americans today, as do the Palestinians. How many nations today would just like the Jews to go away? Wiesel: Sadly, these despicable accusations come from someone who ranked among the great intellectual minds of postwar Europe. Grass was never a great intellectual mind. He is not a successor to Goethe and Schiller, who loved Germany and would have stood up and told the truth about her rectitude. The Jewish-controlled media portrayed Grass as great because he acted the role of the perfectly contrite post-war German. For that, he was celebrated and given every accolade. He sold out to the devil, just like Faust. Wiesel: Iran’s ruler Mahmoud Ahmadinejad is the world’s foremost Holocaust denier. Everyone who reads knows that. But not Grass. Perhaps Grass is tired of being a holocaust believer. Maybe that will come next? But I wouldn’t count on it because he is a leftist and their power is based on the holocaust. Wiesel: [Grass] accuses the Israeli leader (Netanyahu), and consequently his nation, of planning mass murder against Iran—and furthermore, warns German Chancellor Angela Merkel of becoming an accomplice to this crime if she helps Israel. This is so interesting! Wiesel has repeatedly accused (and still does) Adolf Hitler and “his nation” of planning mass murder against European Jews. The difference in his biased mind between his accusations and those of Grass is that Germany was guilty but Israel is not. Yet there is more evidence by far of Israel’s guilt (and from 1945 onward) in wanting to murder the Germans, plus the British and the Palestinians, than of any plan by Germans to murder Jews. You don’t believe that? If so, it’s because you haven’t looked into it for yourself, but have believed Jewish-controlled media all this time. 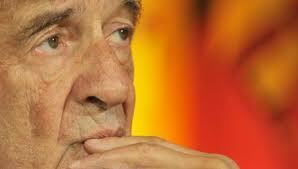 The Israelis and Wiesel greatly fear losing German support. It is the United States that keeps German leaders like Angela Merkel in line. Wiesel: There were times when I even felt close to [Grass]. Now I see in his hatred an abyss I shall not cross. He has gone too far. This recalls to my mind the insistence of the Holocaust-believing Jews to interpret the German word ausrotten which means “to get rid of” or “to root out” or “to eradicate” as “to exterminate“, giving it the sole meaning of “to murder.” Do Wiesel and other Orthodox Jews take the Hebrew word Yemach shemo as literally as they do German words? Something to think about.